Creating a picture collage online is very easy this days. Just select the photos you want to use from your own computer and upload these to the online app. There, you can create a picture collage online in just a few clicks. With a good internet connection, you’ll be ready in just a few minutes. Once your picture collage looks just the way you want it, you can then easily have it printed. 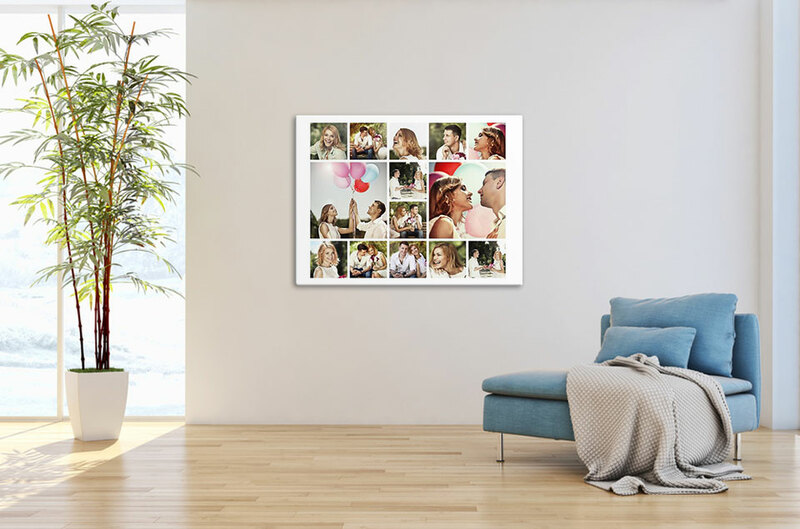 For this, we offer a printing service which allows you to print your picture collage onto a variety of different media, as for example collage canvas. This generally takes only a few working days. We offer several hundred templates in our picture collage maker online, for two to 100 photos. Creating a collage with many photos takes a little more time and effort, however. Text collages or design collages that allow completely personalised design are much more straightforward. The picture collage maker arranges your photos automatically for you but you are free to rearrange them, crop them and even colour them as you want. Try the picture collage maker online now and see how easy it is to create a beautiful picture collage for any occasion. Making a collage picture is much easier than you would imagine. 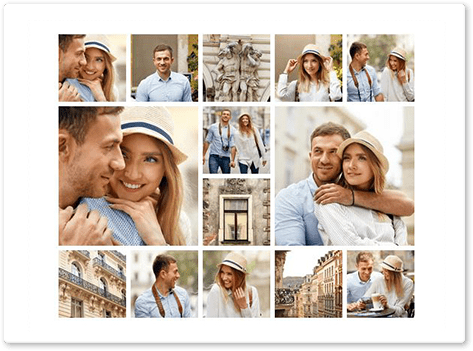 Our picture collage maker saves you time by arranging your photos for you automatically into a template. After uploading your photos, these can be edited at any time, however. So, for example, you can move, colour or crop your photos. These options allow to to create a completely personalised 20 photo collage. There is no limit to the customisation of your 20 photo collage. Once you‘re satified, select the material and size you want for your picture collage and place your order. Your beautiful, original picture collage wall art will be with you, ready to hang, in just a few days.